The Fellowship participates in a number of social justice action projects. If you would like to be involved in any of these activities, please contact Rev Julie Stoneberg or the UFP office. Concerned UFP’ers are interested in gathering in member’s homes to view and discuss films on the topic of climate change and environmental issues. We are collecting film titles and membership. If you would like to join us, contact Verity Barrett or Ian Attridge of the UFP Environmental Working Group. The UFP contributes food and volunteers to provide meals during the cold winter months. 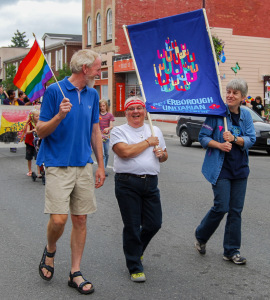 Pride MarchUFP has taken part in the annual Pride Parade for many years. For more information, on Pride Week events, please visit this website. Each December, members of the congregation bring scarves, hats, and mittens, as well as toys, clothing, gift food cards, and cash for families in need. Donations are given to Crossroads Emergency Shelter , the Youth Emergency Shelter, or Niijikawendida . 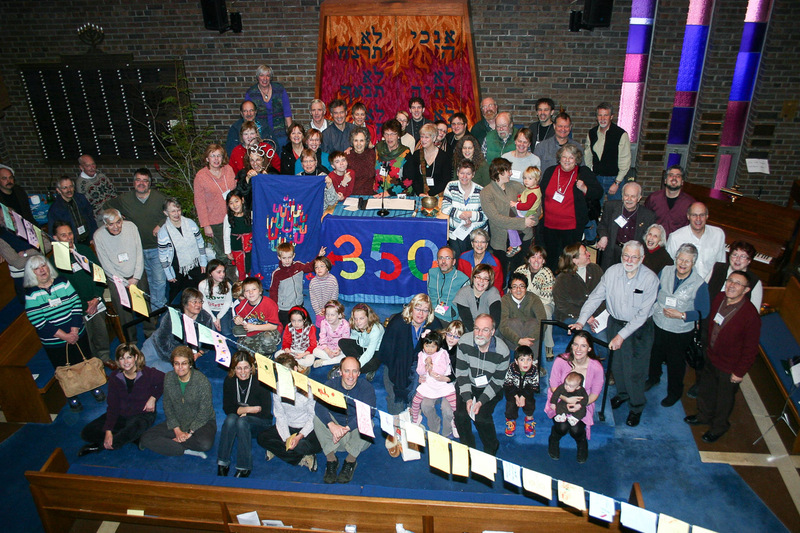 Each September, members of the congregation take part in this event. See photos from past years and register your own group online to easily collect pledges here. Gleaning is the act of collecting leftover crops from farmers’ fields after they have been commercially harvested or on fields where it is not economically profitable to harvest. UFP raises and gives money to pay for buses and volunteers to help to run the program. It is estimated that for every adult Gleaner on the bus, three households benefit: the Gleaner’s home, the Gleaner’s neighbour’s home, and the Gleaner’s extended family. The UFP has for many years been participating in the County of Peterborough’s Adopt-a-Road Program. This involves spring and fall roadside garbage removal. We are responsible for 3.2 km of County Road #4 starting at the corner of Parkhill and Television Road and going east. Each month, the congregation takes one special collection to support a local, national, or global initiative. Sometimes this is in response to a crisis, and other times it is general support for such things as USC-Canada , the CUC’s Sharing Our Faith Fund , or the local food bank. Non-perishable canned and packaged foods can be brought to the Fellowship to be donated to Kawartha Food Share , which distributes food to 39 member agencies in the City and County of Peterborough who operate food banks, food cupboards, and meal programs. Dropping coins in the penny jar on “Florence’s table”* helps this local group, which is affiliated with the Stephen Lewis Foundation, provide support to African grandmothers who are raising children orphaned by the AIDS pandemic. For more information, visit www.grandmotherscampaign.org. Also on Florence’s table* is a container for cancelled postage stamps (Canadian, foreign, and commemorative). These are sent on to Oxfam, which raises about $10,000 a year in this project by selling the collections to stamp collectors. The money raised supports a variety of development projects around the world. For more information, visit www.oxfam.ca/stampoutpoverty. * “Florence’s table” is named in memory of Florence Maynes because of her commitment to social responsibility. As a member of the Unitarian Fellowship of Peterborough from 1975 until her death in 2004, Florence believed passionately that our values must be lived out through our actions, and she often had announcements about social justice, letters, and petitions for us to sign. The table named in her honour is covered with interesting information about ways members and friends can support causes that are in harmony with our religious principles.